Via Tornabuoni. Photo by Pavia Rosati. 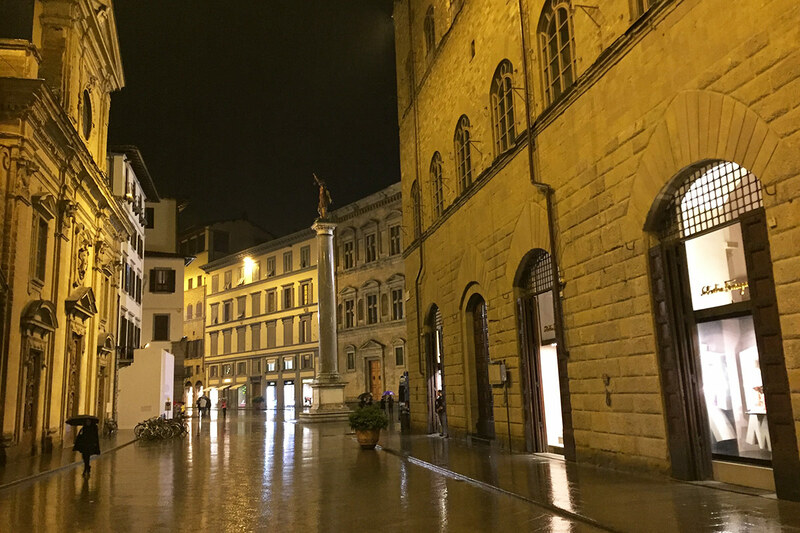 When you fall in love with a city, as academic Chandi Wyant did with Florence, you tend to think of it as yours. Which means you are never quite sure how to respond when the city moves on without your approval. FLORENCE – When I first lived in Florence in the 1980s, I should have photographed the historic 19th-century cafes on Via Tornabuoni. Because when I next made Florence my home two decades later, they were gone. 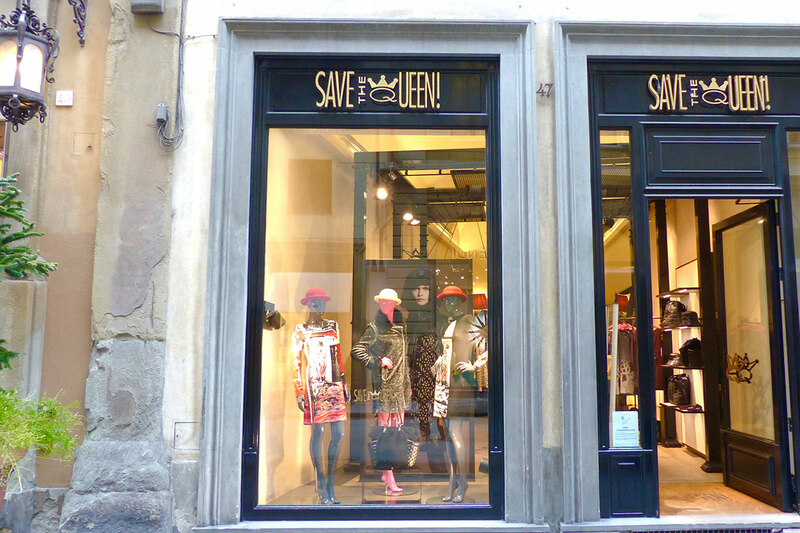 Although I was a backpacking waif in the '80s, totally ignorant of Florentine history, if someone had walked me down the elegant street and pointed out the striking Liberty-style cafes and told me their tales, I would not have believed that places of such distinction would eventually be sacrificed to give way for designer boutiques. In the 1800s, the cafes on Via Tornabuoni were punti di riferimenti, meeting places (literally, "reference points") that were especially popular with foreigners, particularly the British. So popular that the street became known as the Salotto del' Europa, the drawing room of Europe. In the inter-war years of the 20th century, the flourishing English community convened at Gran Caffé Doney, located a short walk across the Arno from the British Consulate. A group of quick-tongued expat ladies known as the Scorpioni ("scorpions") were the regulars who inspired the film Tea with Mussolini. When Mussolini invaded Ethiopia, the British residents of Florence made their disagreement known, and the Fascists attacked Doney. When World War II broke out, the Scorpioni were arrested and taken into custody in the Tuscan hilltown, San Gimignano. Doney closed in 1986. 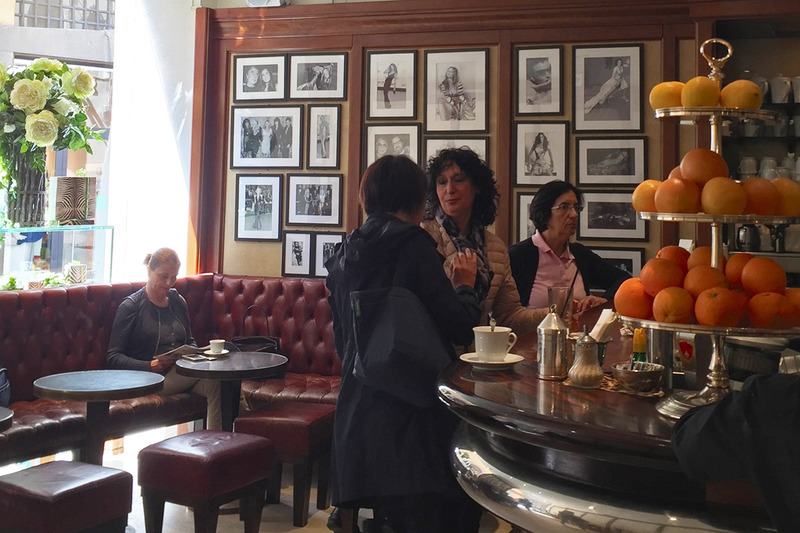 Caffé Giacosa, another elegant Via Tornabuoni institution that I had long admired for its aged mahogany and Liberty decor, was founded in 1815. A favorite meeting place of locals like Prince Ruspoli, it was here that the Negroni cocktail was invented in the 1920s. So much history. So much style. So different from bars and coffee shops in my native California. Today, the location is a boutique of Florentine designer Roberto Cavalli; the café within is a smaller version of the original. Caffé Giacosa, nowadays. Photo by Chandi Wyant. Why were these historical places being sacrificed in a city so proud of its patrimony? Determined to learn more, I interviewed knowledgeable locals for a book I planned to write. I began with Paolo Milli, the owner of Seeber, the large and beloved Via Tornabuoni bookstore founded in 1864. We met in 2002, when Seeber was due to close and Max Mara was about to move in. I was in the nick of time. "The ecosystem of Via Tornabuoni has totally, tragically changed," Paolo told me as he led the way up a narrow flight of stairs to his office above the shop. With disheveled hair and a loose-fitting wool sweater, he looked like the movie version of a bookstore owner. He spoke rapidly, his tone showing a deep concern for the subject. "Do you remember Doney?" he asked, gesturing in the direction of the Arno. "It was founded in 1827 and known for its hot chocolate and gelato. Cercherini, a wonderful shop that sold instruments across the street, is also gone. We had a collaboration with them, we hosted a concert with them here in the store." Paolo grinned as he told me about moving the piano across the street. "You see, we all used to know one another here. These stores had a feel of authenticity. The new stores…" He let out a sigh. "They lack this flavor. Have you seen the new Giacosa that Cavalli opened?" "I haven't gone in," I replied. "E' una cosa vulgare!" he exclaimed. It is a vulgar thing. I laughed as he went on to explain that for Cavalli to get the license to destroy the historic cafe and put his designer shop in its place, he had to agree to reopen Giacosa. "So what stands now is a large designer store, the same one could find in Milan or Paris, and a small vulgar place at the back with Giacosa's name on it." "Profumeria Inglese is gone, too," I added, referring to the beautiful pharmacy with Renaissance arches, where talcum powder was invented. "The city has become a playground for tourists," Paolo said. "We cannot turn back now. Big money has won. Armani spends 35 million euro for the rent next door and gave the owners of the original shop 8,500 million euros to go away. Those of us who care about the authenticity of the city are no match for this kind of money." Paolo's bookstore would be moving to a location on Via Cerretani. The writing on the wall. Photo by Margaret Leon. The writing on the storefront. Photo by Margaret Leon. "We couldn't stay here anyway, the neighborhood has changed too much. In order to stay, we'd have to offer calendars in Japanese. This store has been a meeting place for the city for almost a century and a half. D. H. Lawrence, Hemingway, Hitler — they all stopped in here. The store can never be the same on Via Cerretani." A few days later, when I visited Hotel Beacci Tornabuoni to make reservations for my clients, the owner invited me in for a coffee. We settled into mint-green sofas in the high-ceiling parlor, which looked like a drawing room in a Renaissance villa with its fireplace, bookshelves, massive tapestries, and inlaid parquet floor. Signore Bechi, a quiet man with delicate hands, told me, "Yes, big money is taking away some of our patrimony. But while money can be helpful, it is not the finality of life. Florence is a world property; it is no longer just for Florentines. It is a masterpiece for all the world, and this city must be preserved for all the world." "It seems to me," I offered, "that even though millions of visitors want to shop, it's crucial to preserve the city's history, which is…" I paused, looking for the word in Italian, "unparalleled." "People must come here not to buy Florence but to let Florence give them something deeper, which they can have for the rest of their lives. A love for Florence, like what you have," he looked at me earnestly, "is not something you can buy. Florence is not only a big shop. It is a place where you can become a better person." "No one can know Florence unless they've seen the Seeber bookstore. A jewel that has withstood the test of time and survived the historic events of our country, it remains a lively meeting place today, a place filled with memories and known worldwide." Would anyone ever write something like that about Max Mara? Via Tornabuoni at night. Photo by Chandi Wyant. 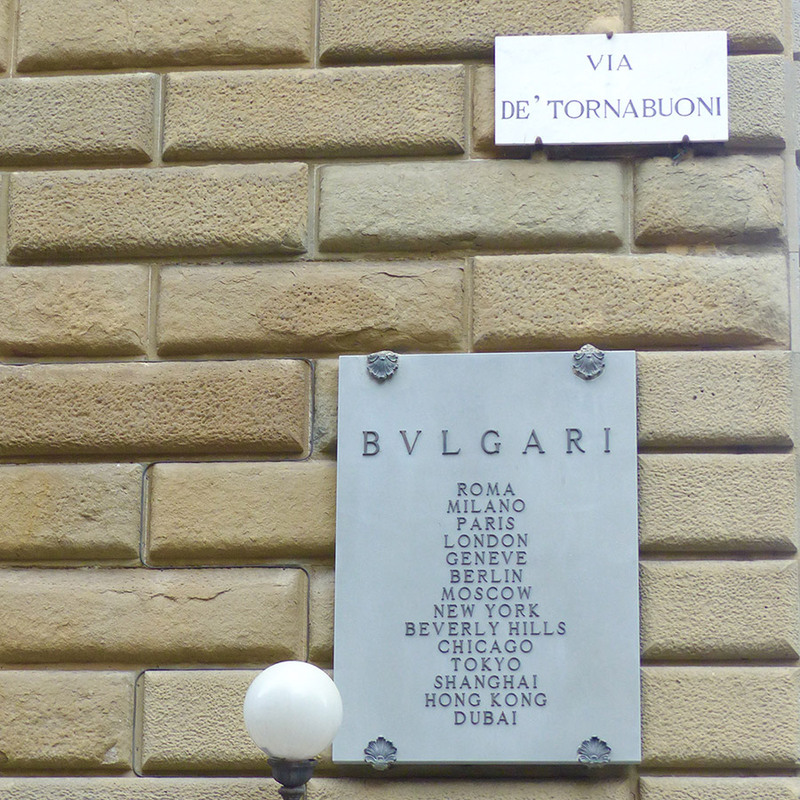 When I visited Florence again in 2011, I rounded the corner of Via Parione on my bike, turning into Via Tornabuoni where it sweeps wide around the ancient Roman column that holds the Statue of Justice, as I had done so many times when I lived here. Only this time, the great ribbon of the road from the Arno to Piazza Antinori was breathing freely, unfettered by rumbles of tires and horns of cars. It had been turned into a pedestrian-only street. Then in 2014, I was pleasantly surprised again. The street now glistened with new pavement made from pietraforte stone from the Appennines placed in a herringbone pattern and sidewalks done in pietraserena from nearby Fiorenzuola. The remnants of the Salotto dell Europa may have been wiped away, but the statuesque street can now be admired fully in its new car-free form. Altered irrevocably by the march of time, Via Tornabuoni is still undeniably Florence's most elegant street, and one of the most elegant in the world. Chandi is a historian who loves salsa dancing, paddle boarding, and travel writing. She runs Paradise of Exiles, a website about travel and expat life. You can follow her on Facebook and Instagram. She travels for the history, the food, and to promote cross-cultural understanding.